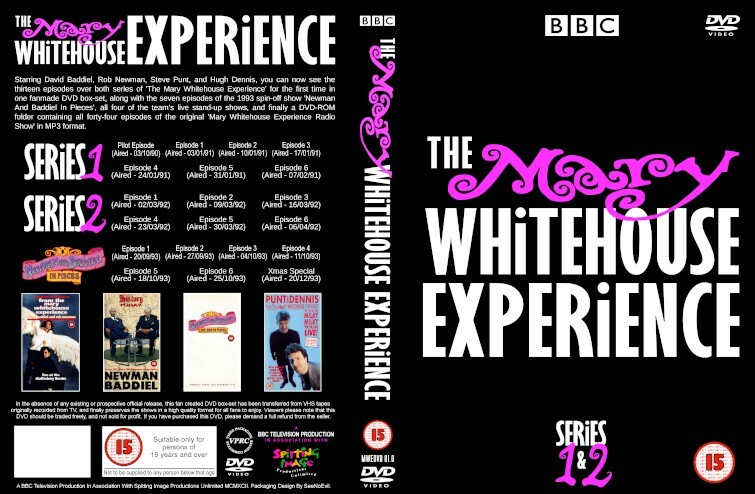 Starring David Baddiel, Rob Newman, Steve Punt, and Hugh Dennis, you can now see the thirteen episodes over both series of 'The Mary Whitehouse Experience' for the first time in one fanmade DVD box-set, along with the seven episodes of the 1993 spin-off show 'Newman And Baddiel In Pieces', all four of the team's live stand-up shows, and finally a DVD-ROM folder containing all forty-four episodes of the original 'Mary Whitehouse Experience Radio Show' in MP3 format. In an ideal world I had wanted to also include the Steve Punt & Hugh Dennis spin-off shows; The Imaginatively Titled Punt And Dennis Show and Punt And Dennis Series 2, and I do have low quality AVI downloads of both series', but I'm happy settle for what I have at the moment till I can get higher quality source footage to expand the set. If anyone can help me with these, or has their own home-recordings of The Mary Whitehouse Experience or Newman And Baddiel In Pieces, please PM me. I'm having some trouble with a project I'm working on. I thought I'd made a post to see if anyone on here can help me out. I've just completed a previous VHS to DVD transfer project; a Gamesmaster Series 1-7 Complete DVD Box-Set (Gamesmaster was a UK Channel 4 kids computer games TV show), and am looking to do a similar thing with The Mary Whitehouse Experience. If you don't remember it, The Mary Whitehouse Experience was an excellent British comedy sketch show with David Baddiel, Rob Newman, Steve Punt, and Hugh Dennis shown on BBC2 with two series' shown over 1991-92. You can read more on the Wikipedia entry here. All the episodes are out there on the internet, but only as poor quality VCD MPEGs, some with frequent screen breakups and some endings missing. There is also a bootleg DVD available which can usually be found on EBay, but that just uses these exact same VCD files too. I'm looking for someone who recorded both series' on VHS when they were shown on TV originally, and who would be prepared to let me borrow their tapes, so I can do a high quality capture and create a proper DVD, as I did with Gamesmaster, and a number of other titles in the past. If anyone can help me out on this, or knows someone/somewhere that might be able to help, please get in touch via PM or email. Just wanted to add an update here, I know this thread has been dead for a few months now, but it looks like there is light at the end of the tunnel. I made the original post on the 22nd of July 2010, and the project never really went anywhere, although I did keep looking. On the 27th of August 2011, someone sent me a link to an Ebay auction in which a seller had listed 149 VHS tapes, which included home recordings of shows like The Big Breakfast and Top Of The Pops, as well as The Mary Whitehouse Experience. In the end, the auction went above what I was willing to pay; £52 and collection-only from Leicestershire (a fair distance away) didn't help. I got in contact with the seller and luckily he'd transferred all these tapes around 8 years previously using a brand new top of the range Panasonic S-VHS machine with Digital Noise Correction. I traded for DVD copies of what he had; all six episodes of The Mary Whitehouse Experience Series 2, and six of the seven episodes of Newman And Baddiel In Pieces. This project then languished for months on my hard drive, but I did create a DVD cover which I've just got round to completing yesterday (see below). Sorry I can't help, but thanks for reminding me how great this series was. Hope you can find someone who still has this on tape. TheBox has series one and two. Just checked this, the ones there are the same MPEG VCD versions I mentioned in my first post. Thanks for the heads up all the same though. Ever thought of doing the crystal maze? Not really, I did watch it at the time but I'd not be inclined to spend months working on a VHS preservation project. Isn't this shown on Challenge TV now? that would seem a much better option as someone could just record it straight to DVD? I've got all four series of the Mary Whitehouse Experience radio show as MP3s I can add in to a DVD-ROM folder on the disc. Another worthy addition may be the two Newman & Baddiel VHS releases; History Today (1992), and Live And In Pieces (1993), neither of which have been released on DVD. Maybe even both series of the Punt & Dennis show, which have only had a 90min 'best of' DVD released up to now. They is series 1-4 most are digital rips and a few analog (which i have) and 2 episodes of series 5, its just the rest of 5 and all of 6 is missing also i have two kid specials. I think your quest maybe over. I have been hunting high and low for these for almost 15 years (since BBC2 repeated them). The MPEG versions don't look to bad when on DVD and upscaled - but they were recorded off an old SKY channel around 2001 and the only known full set available ANYWHERE. YOU CAN REQUEST EPISODES FROM THE BBC - BUT YOU ARE LOOKING AT £375 PER EPISODE - PER DISC! If you go down that root you cant share. I have dvdrs with series one and two of Mary whitehouse experience and Newman and Baddiel in pieces including the xmas special somewhere. quaility should be better than the vcd mpegs. series two i transferred myself but the tape was showing signs of wear. is this boxset still available anywhere? You can contact me though that site too.